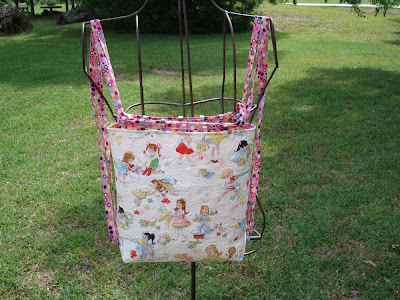 Calamity Jane's Cottage: Quick Post and it's #150-Details coming soon about a Giveaway!!! What an adorable backpack. Love the fabric. And the quilting is beautifully done! That fabric is just PERFECT for that backpack!!! Thank you for coming by and entering my giveaway - I shall let you know if you win - best wishes! and I love the fabric !!!! It is a lovely bag Bonnie and gorgeous fabric. Love the fabric, such a cute bag. I'll saw Congrat's NOW...in case I miss the 150th post. 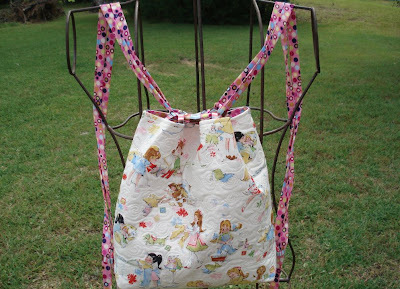 Very cute backpack...and the fabric is WONDERFUL!!! Too cute Bonnie! We'll be watching! Love the fabric and the quilting. 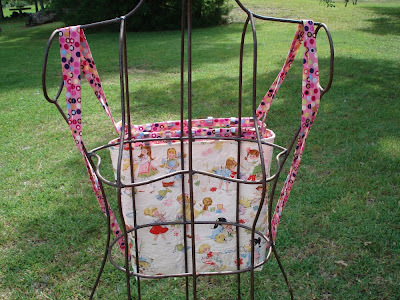 What a super backpack that any little girl or her Mom would cherish. Now that is SUPER CUTE! Love the quilting on it! OOhh that is so sweet, I love the fabric! I'm putting this here so it doesn't get mixed in with the give away..I did get my calamity's mixed up! I have you 2 listed in my fav blogs and I always get you mixed..Gnomes, tea cups, Gnomes, tea cups...sorry! So cute and the quilting is darling! Yes. This is one of my favorite fabrics. Love the back pack idea.